On every Uniworld ship, you don’t have to venture far to enjoy delicious farm-to-table comfort cuisine sourced directly from the destinations you’re sailing through. Uniworld’s newest Super Ship, S.S. Beatrice, was designed to bring the flair and flavors of Central and Eastern Europe to life onboard. Through enhanced culinary experiences and innovative new dining venues, S.S. Beatrice provides you with a taste of your destinations before you ever step onshore. Delight in classic European fare with a Uniworld twist at Schubert’s, a new Austrian-styled eatery located at the bow of the ship. This cozy eatery features menus reflecting the cuisine of the ship’s destinations, with fresh farm-to-table ingredients, shareable plates and recipes from Bea Tollman, author of A Life in Food. Plan a phenomenal evening in by cooking alongside the chef at Max’s. Learn how to prepare your very own three-course Central Europe-inspired meal. Or opt for a steak dinner, prepared right in front of your eyes with your choice of locally sourced, dry-aged prime cuts of beef. Stop by Mozart’s, the main dining room for delicious cuisine around the clock, like Vienna slowcooked veal ragù. Or swing by the elegantly appointed Wolfgang’s lounge and bar for a signature cocktail, made with your choice of liquor, including 11 different vodkas and 28 different whiskeys and bourbons to choose from. 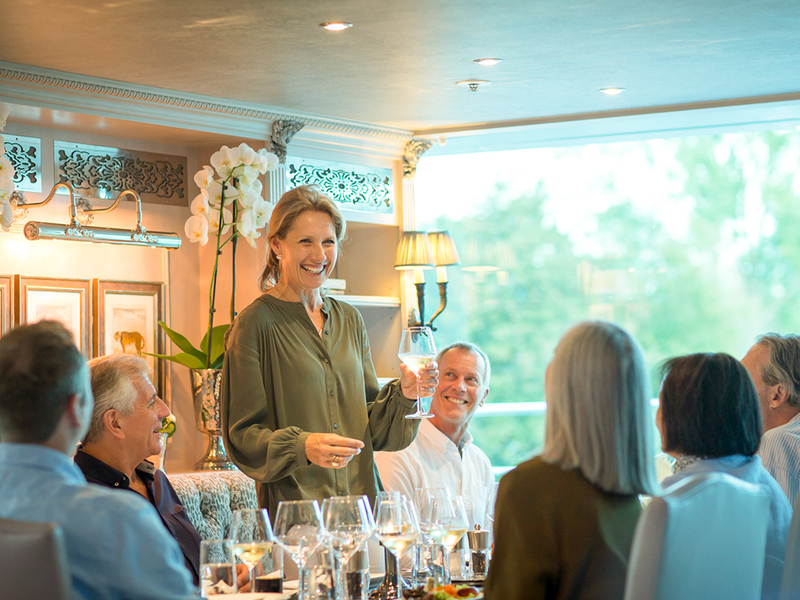 Onboard Uniworld’s breathtaking S.S. Joie de Vivre, aficionados of French food and wine will be delighted by the appetizing culinary creations served at her four Parisian-inspired dining venues. Le Bistrot, the ship’s very own Parisian-style sidewalk café, serves classic French fare. Designed with windows that lower for an open-air ambiance, Le Bistrot is an ideal spot to savor wraparound views of the Seine and beyond. Revel in a magical evening at Claude’s, as Club L’Esprit transforms into a vibrant dining and entertainment venue, offering hors d’oeuvres and signature cocktails. 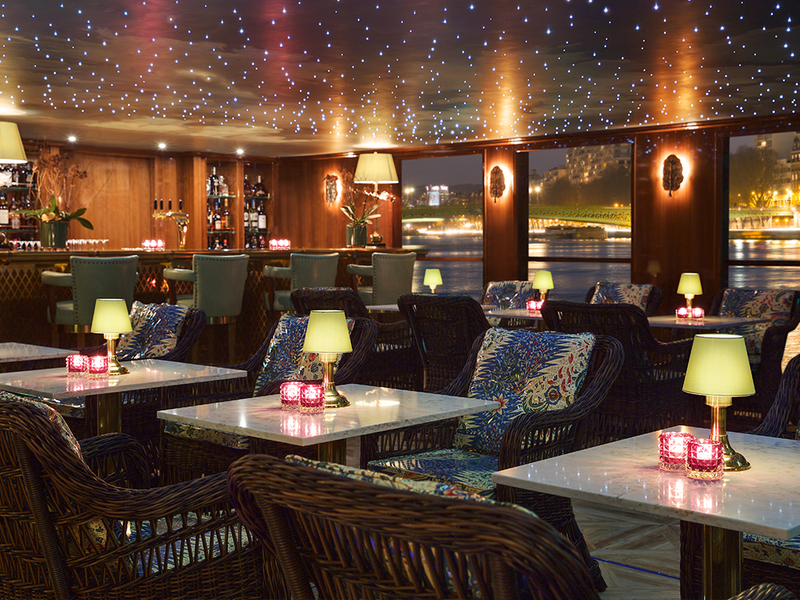 Relish an exclusive epicurean event at La Cave du Vin, S.S. Joie de Vivre’s onboard show kitchen. Under the guidance of Uniworld’s chef, you’ll prepare an exquisite seven-course meal, accompanied by a wine-pairing presentation led by their onboard sommelier. The ship’s main restaurant, Le Restaurant Pigalle, enables you to sample iconic French dishes, desserts and drinks. Bon appétit!